"Come on in, don't be shy." Samuel Goldwyn Films has debuted an official trailer for the indie action thriller Avengement, an intense new crime film made in the UK. This is the latest collaboration between Adkins and director Jesse V. Johnson, they also made Triple Threat together. Avengement is about a lowly criminal who is thrown in jail and made into a cold-hearted killer. While on furlough, he escapes his guards and goes for revenge on the people who set him up. The cast includes Craig Fairbrass, Thomas Turgoose, Nick Moran, Kierston Wareing, Leo Gregory, Beau Fowler, Louis Mandylor, and Terence Maynard. This looks like your standard revenge action flick mixed with prison brutality, without much more to offer. 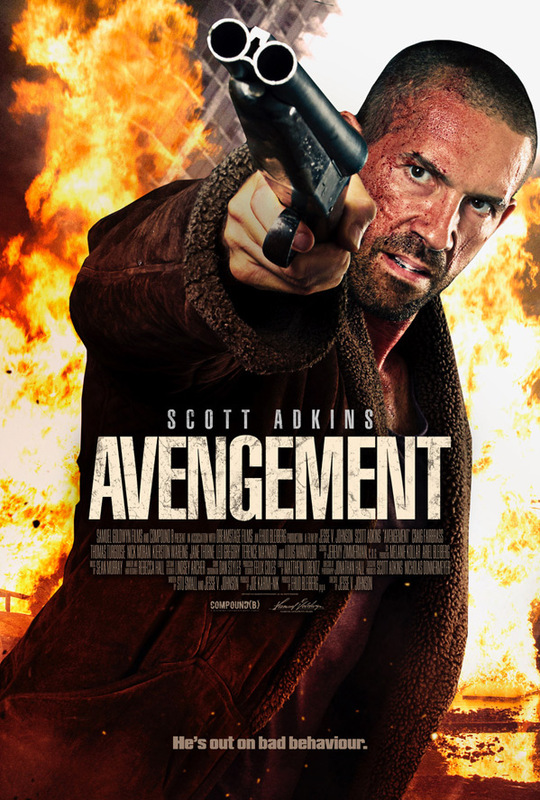 While released on furlough from prison, a lowly criminal (Scott Adkins) evades his guards and returns to his old haunts to take revenge on the people that made him a cold-hearted killer. It’s an epic, bloody battle to search for the soul he lost years ago on the streets of an unforgiving city. Avengement is directed by English filmmaker Jesse V. Johnson, a former stuntman now directing films including The Honorable, Pit Fighter, The Last Sentinel, The Fifth Commandment, The Butcher, The Package, The Beautiful Ones, Savage Dog, Accident Man, The Debt Collector, and Triple Threat previously. The screenplay is written by Jesse V. Johnson and Stu Small. Produced by Ehud Bleiberg and Joe Karimi-Nik. Samuel Goldwyn Films will release Johnson's Avengement in select theaters + on VOD starting May 24th coming up. Interested?